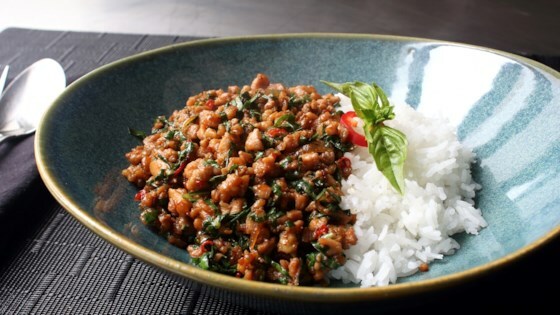 "My version of this classic Thai dish has spectacular taste even with regular basil instead of Thai or holy basil. The sauce actually acts like a glaze as the chicken mixture cooks over high heat. The recipe works best if you chop or grind your own chicken and have all ingredients prepped before you start cooking." Makes 2 large or 4 small portions. To slice basil leaves, stack about 5 of them and roll tightly like a cigar. Then slice into thin ribbons. Make a couple of cuts in the opposite direction for smaller pieces that cook faster.